The wingtip brogue is a staple in many men’s wardrobes today, but the longwing brogue is still making it’s way back from the 1970s. We’ve had the chance to try out this style in Grant Stone’s Longwing Crimson. These standout shoes feature a Goodyear welt over a thick, stacked leather sole, a pull-up leather upper, and have a great vintage sense of style. Grant Stone‘s small team is directed by Wyatt Gilmore, a third generation member of his family to be in the shoe business. Wyatt has spent years living near their factory in Xiamen, China, drawing from the decades of experience in his family as well as their factory to design their shoes. Grant Stone seeks to add their own touch to classic styles, making shoes that would be hard to find copies of elsewhere, with well fitting designs and high end materials. Grant Stone’s leathers are sourced from the USA and Europe. Each pair of shoes is shipped with a pair of single-shoe dustbags. The Longwing Crimson is a longwing brogue derby. Surrounding a steel shank, cork fill, and rubber heel is nothing but leather. The upper is a lovely, heavy weight aniline pull-up leather dyed in-house. The sole is Goodyear welt construction, with an impressively thick stacked leather sole and open channel stitching. The heel has a small rubber insert for longer wear and traction, but the sole is otherwise leather, and can be replaced by a cobbler when it finally wears through. Between this and the quality, thick upper, you’re looking at a shoe with a long lifetime. Overall construction across the shoe is done very well. It gives the appearance and function of a high-end shoe. There’s a few minor inconsistencies, but they’re cosmetic and only visible at very close inspection. From a construction standpoint, Grant Stone seems to have taken a fair amount of inspiration from Alden. The steel shank first made me feel this way. Alden is known for using them, in comparison to companies such as Allen Edmonds, who have chosen to forego the durability of a shank in favor of a lighter and more flexible shoe. The rubber heel portion, overall design of the sole, and quality of materials used enforce the Alden comparison as well. The first thought you’ll have upon putting on the Longwing Crimson for the first time will almost certainly be that this is a heavy, thick soled shoe. Fears about a long, painful wear-in period definitely come up, but I was surprised to discover that this wasn’t an issue. The comfort wasn’t as instant as a thinner, lighter shoe, but for how thick and stiff the sole is, the wear in was pleasant. Over time the midsole molded to my feet and the shoe softened up. A nice vamp crease has developed, and scuffs in the leather can easily be rubbed out or given some treatment and brushing. The Longwing Crimson is such a tough shoe that it may take a little time, but they’ll eventually become like an old friend who sticks with you year in and year out. 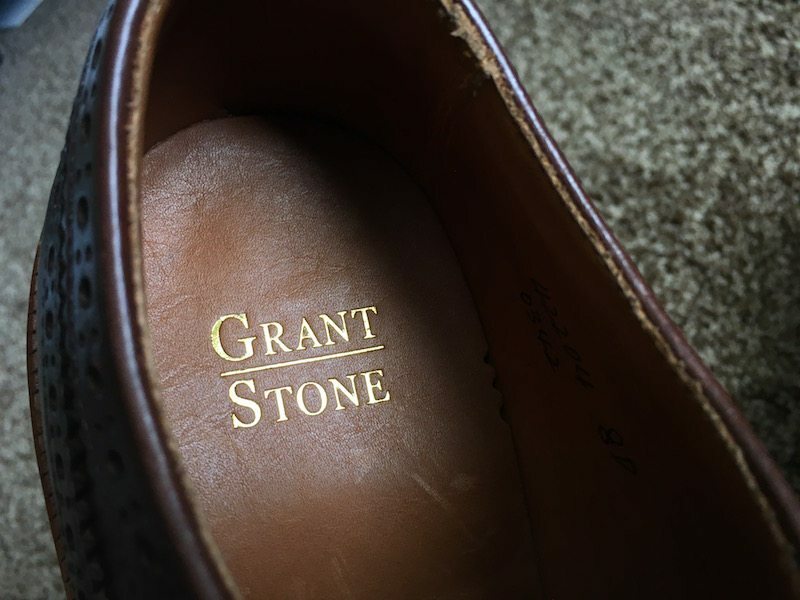 Like many formal shoes, Grant Stone’s tend to run a bit large, in part due to the Leo last used to form them. I’m typically a US 9 for tennis shoes and a US 8 for formal shoes, and a size 8 Longwing Crimson was right for me. A longwing brogue is a unique style that stands out amongst similar shoes, though in a subtle way. The brogue pattern extends to the back of the heel, rather than ending around the ball of the foot with a typical wingtip. In addition, Grant Stone’s Leo last makes the shape stand out–it gives the toe area a bit more roundness and space than many similar shoes. While the highly fashionable amongst us will pull these off with cuffed jeans (as a longwing or wingtip shoe is technically less formal than a quarter- or half-brogue), I personally favored pairing the Longwing Crimson with a suit and tie. Whatever setting you like them in, one thing is for sure: this is a beautiful shoe, and you’re going to get compliments. The crimson color tends to range visually from brown to a deep red/orange color depending on the light. The aniline finish of the pull-up leather shines well and really catches the eye. The whole effect is a savory high-end shoe with a bit of a vintage flair, thanks to the longwing brogue and thick edging. The Grant Stone Longwing Crimson is a very tough and stylish shoe. The longwing brogue design and more rounded toe area give it a subtle uniqueness. 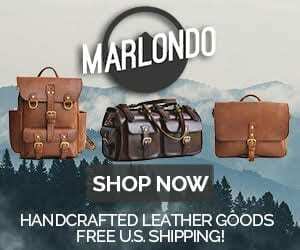 The quality leathers will make it stand out in whatever setting you choose to wear them in. There is a wear in period, but it’s surprisingly comfortable even in this phase. I made the comparison to Alden’s construction style, but thankfully, the price doesn’t even approach that of the more famous brand, and this could be a a great economic alternative. With proper care and resoling, the Longwing Crimson will last for many, many years, and I highly recommend them to those wanting to add a bit of flair to their shoe collection.